Joe Jackson, the father of music legends Michael and Janet Jackson, has died at age 89, his family said. Jackson passed away early on Wednesday morning. He had been in hospital for terminal pancreatic cancer, according to media reports. His death comes just two days after the anniversary of his son Michael Jackson's death nine years ago. The family patriarch played a large role in the careers of The Jackson 5, as well as Michael and Janet Jackson. Five of Joe Jackson's sons - Jackie, Tito, Jermaine, Marlon and Michael - became the Jackson 5, joined at times by younger brother Randy, who also pursued a solo career. Three daughters - LaToya, Rebbie, and, most famously, Janet - all fashioned their own pop careers under Jackson's management, with varying levels of recognition. Jackson was the architect of his children's early successes, but some of them would later say he drove them with a zeal that bordered on abuse, with Michael and others alleging bullying, physical abuse and punishing work schedules. 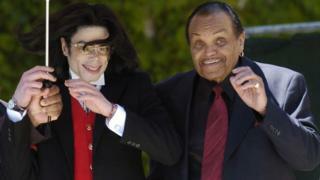 Jackson later admitted that he had whipped Michael, but denied it could be categorised as a beating. "I whipped him with a switch and a belt. I never beat him. You beat someone with a stick," he told the BBC's Louis Theroux in 2003. The interview made headlines after Jackson said in response to a question about Michael, "We don't believe in gays. I can't stand them." "No one knew what was going on - we shouldn't have to beg, plead, and argue to see our own father, especially at a time like this," he said. "We have been hurting. We were not being told where he was and couldn't get the full picture."